One of these days, I may even get around to adding a full list of all my past and upcoming conference appearances. But today is not that day. Everyone says my OSCON 2014 Keynote was amazing. I actually think it’s amazing too, and I’m my own worst critic. Check it out. Closing Keynote Address from the FOSDEM 2013 Conference. You can also check out the video of this presentation in the FOSDEM video archives. Keynote Address from the Linaro Connect Europe 2013 Conference, Cultivating Community: Best Practices for Overcoming Challenges to Collaboration. I’ll be speaking at Infratructure.Next on February 5, 2014, where I’ll cover DevOps: For Happier, More Productive People. I’ll also be attending FOSDEM 2014 and several of the other events that have coalesced around the same time frame, so look out for me at the CentOS Dojo and Config Management Camp EU. I’ll also deliver a Keynote Address at SCALE 12x, addressing the topic Why Checking Your Privilege is Good For *You*. SCALE takes place February 21-23, 2014. I gave the opening Keynote Address at T3CON13, reprising my presentation from FOSEM 2013, The Keeper of Secrets: The Dance of Community Leadership. I also gave my first ever Pechakucha style presentation (a.k.a. 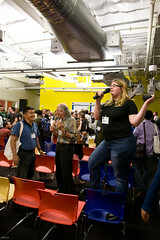 Ignite Talk) and participated in my first fishbowl discussion. You can watch the videos from the Community Pechakucha (my presentation starts at 18:30) and Community Fishbowl sessions. I delivered a Keynote Address at Linaro Connect Europe 2013. The video is linked from this page. I also spoke at OSCON 2013 along with Amye Scavarda on Choose Your Own Adventure – Growing Your Own Career in Open Source. I gave the Closing Keynote at the FOSDEM 2013 conference. The video is linked from this page. I gave the Opening Keynote at the 2012 Berlin Buzzwords Conference on Cultivating Community: How to Make Your Project Blossom. The presentation focused on what community is, what it is not, how to build one well and how to keep it healthy and vibrant over time. Amye Scavarda and I reprised our talk from the 2011 Grace Hopper Conference at Portland’s Code ‘n’ Splode User Group meeting. At the annual Linux.Conf.Au conference, I presented “Mentoring: We’re Doing It Wrong,” a talk focused on the results expected and achieved in free and open source software mentorship programs. While not a speaker, I was invited to the inaugural ConvergeUS Annual Gathering and have volunteered time to assist their Early Childhood Literacy Initiative. I joined the rest of the staff of the OSU Open Source Lab in speaking at the student focused workshop at LinuxCon North America 2011, Linux Learners Day. The conference takes place in Vancouver, British Columbia, Canada on August 16-19th. I also attended the Government Open Source Conference (GOSCON) in Washington, D.C., USA on August 23rd. I spoke on a panel at the annual UMass Amherst Information & Communication Technology Summit on March 31st. The panel topic was be Open Collaboration. I spoke at the Palmetto Open Source Software Conference (POSSCON) in Columbia, South Carolina in the Education Track. On Thursday, March 24th, I covered “Student Involvement in Open Source: Why, How and Where to Get Involved.” This talk was videotaped. I’ll attended the Humanitarian Free and Open Source Software Symposium in Dallas, Texas on March 9th. The Symposium was a pre-conference activity for the ACM SIGCSE Conference. I moderated a panel on Getting Started in Free and Open Source Software as part of the first ever Open Source Track at the Grace Hopper Women Celebration of Women in Computing Conference. I also gave a talk with colleagues from the Humanitarian FOSS project at the K-12 Computing Teachers Workshop.